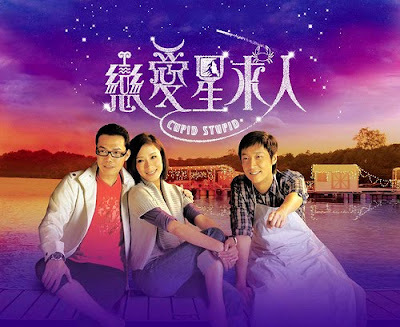 Cast: Steven Ma, Tavia Yeung, Michael Tse, Mandy Cho, Law Lok Lam, Jack Wu, Ruco Chan, Lau Dan, Lo Hou Gai, Ram Tseung, Lee Kwok Lun, Iris Wong, Fred Cheng, Benjamin Yuen, Helen Ma, Shermon Tang, etc. 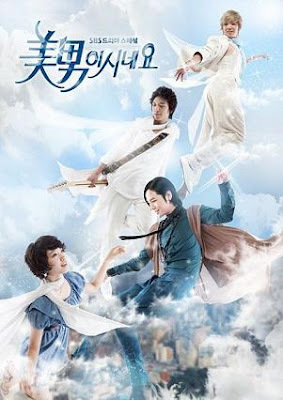 I just finish watching the 16 episode Korean Drama, You're Beautiful. Yes that series is in my favorite series list. It was one great awesome Kdrama I saw... and yep, now I'm obsessed with it and I miss it =[ The drama is really interesting, its comedy and romance. The story line is really sweet. Try It, I recommend it xD. I'm going to put up a full write up after my midterm exams. So sorry guys.. I'll be away from foreverloveTVB. I guess this mean that foreverloveTVB will go on a short Hiatus. But you all can still leave me messages xD. I'll reply to those. That scene above is very memorable. The scene in the middle was the night before Go Mi Nam (Park Shin Hye) goes and promote his video. The others are not going with him. And Mi Nam was outside looking at the stars, Hwang Tae Kyung (Jang Geun Suk) came out and talk to her. It was dark out and they were looking at the stars. But Tae Kyung couldn't seen them because he has dark blindness. Tae Kyung start to have feelings for her and he told her that, don't go anywhere that I can't see you. Stay close to me so I can see you clearly. "It's Frustrating that I can't see you" But when he said that Mi Nam already decided. She has to go away and reveal herself, she doesn't want to get involved between Tae Kyung and Yoo He Yi (Uee). Mi Nam thought that Tae Kyung likes Yoo He Yi and He Yi told her to reveal herself during the promotion. So the other two pictures on the side is her dress up as herself and he in the back. Which it was dark cause the press and director, fans where watching her music video. Tae Kyung was looking for her and he yelled out "I told you not to go where I can't see You". That scene and the that line is really memorable. The line represent them. Its a very sweet/sad scene. You'll need to watch yourself xD. 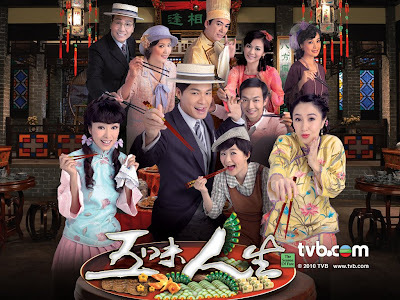 Cast: Roger Kwok, Esther Kwan, Michelle Yim, Ng Wai Kwok, Derek Kwok, Vivien Yeo, Oscar Leung, Aloys Chen, Mimi Lo, Pierre Ngo, Regen Cheung, Elena Kong, Ha Ping, Felix Lok, Yvonne Lam, Irene Wong, etc. Tavia born on August 30th in 1979. Graduated from TVB 13th acting class in 1998 is today's TVB fa dan. Graduating along side with TVB siu sang Raymond Lam and Raymond Wong. Having graduated from TVB. Tavia started off her career with many cameo role. Tavia portrayed as Maggie Chueng little sister in "When Dreams Come True" (starring Liza Wang) as ah Yan. Which Tavia really reassemble Maggie. Each year, Tavia tried her best and Improved a lot. In 2003 she finally got the most improvement award starring as Kelly in Vigilante Force. From then on Tavia would work hard and she finally got where she is today. After many different roles, Tavia was chosen to lead in "Twins of Brother" with Raymond Lam and Ron Ng. And also in 2006 Tavia lead in "The Academy" along side with Ron Ng. With many supports and achievements, Tavia stand where she is today being TVB's Fa Dan. I first notice Tavia in The Academy. Where I thought her acting was good. The love chemistry with Ron bought me in being a TaRo fan. I did see Golden Faith as a child and remember her role as Kiki.. but then I didn't know who she was. In 2007 Tavia received an award as Best Actress by sina.com. Improvement kept on showing and I loved Tavia in Moonlight Resonance. Where I thought she portrayed her role well. Her crying scenes are amazing. Where you can feel her pain and tears. 2008 Tavia received an award for Best Supporting Actress. In 2009, Tavia's breakthrough role as a villain in Beyond the Realm of Conscience, bought her more praise and applaud from the audience. Tavia was nominated for Best Actress for her role as Yiu kam Ling. Which I thought Tavia did job well done. Which she was hot favoured to win along side veteran actress Sheren Tang and TVB's leading lady Charmaine Sheh. Which she lost the award to Sheren Tang, Tavia manage in winning two awards. Winning the Favorite Female Character and Best Performance of The Year, Tavia had already done her best in 2009. Now in 2010, Tavia going shoot up again and tried her best. Each year watching Tavia on screen, I have the same feeling, which she is improving. A.N.JELL is popular idol group in Korea, the group initially consists of Hwang Tae Kyung (Jang Geun Suk), Kang Shin Woo (Jung Yong Hwa) and Jeremy (Lee Hong Ki). Tae Kyung is the leader of the group, as well as a composer, but his vocals are slightly lacking which prompted President Ahn (Jung Chan) to look for an additional member. President Ahn decided that Go Mi Nam (Park Shin Hye) would be the best candidate in entering the group. Go Mi Nyu, Go Mi Nam's twin, is a sister-in-training. At the beginning of the drama she was about to travel to Rome to become a nun. However, she came across Manager Ma (Kim In Kwon) who tells her that her brother has been accepted by Korea's top group but has difficulty in going back to Korea as he is currently in the States undergoing surgery to correct his previous plastic surgery procedure. He pleads with her to fill in for her brother until he returns. Mi Nyu reluctantly promises remembering about her brother's dream to become an established singer in order to find their long-lost mother. The rest of the drama displays the love triangles; Tae Kyun-Min Nyu-Shin Woo-Jeremy and Min Nyu-Tae Kyung-Yoo He Yi (UEE), along with Tae Kyung's impassive relationship with his mother, Mo Hwa Ran (Kim Sung Ryung), who was also a famous singer in the past. Who will Go Mi Nyu choose in the end? Will she be exposed for pretending to be a guy? Will she learn more about her mother? Hi everyone xD I'm back!! Sorry, about the delay. I know I had regionally said I'll be back on the 2nd but I took even longer. Sorry!! *sigh* I took long to change a new layout..and I still don't think I like it..lol. I guess its alright, I kinda want to go for a darker color. Cause its winter for me and it had been snowing and I thought of blue and gray. LOl... but I'm still not done yet, still learning how to make it better >.< Hope you guys love my new banner =] it's Linda Chung xD ft. her quote from "legend of demigods." Artists of the month will be up soon. I have been neglecting it. Just a reminder that the artist with the highest votes does not mean that they'll be the winner. I'm choosing the artists. But I promise you it'll be satisfying. I'm choosing from the top 5 highest votes, he/she who I think is doing awesome. The artist who I think should go up this month xD Also January babies will be up soon too. Also Happy New Year to ALL!!! Hope this new year will bring all of you prosperous, wealth, healthy and many great fortunes! !